1.) Managing your State Training Requirements is getting more difficult. 2.) Maintaining your Childcare Ratio’s during staff training is a struggle. 3.) Training hours and State Requirements keep increasing. 4.) Training Expenses are getting out of control. If you say yes to any of the statements above, we can help you. 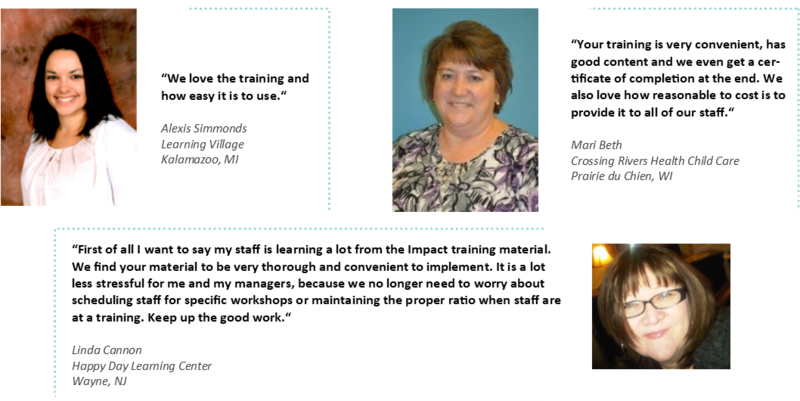 Here are some of the things you get when you partner with us on your training needs. • Unlimited Access to 115+ childcare training for you and your staff. • Certificates and Transcripts automatically issued and stored upon completion of each training. • Individual Access to the training site for each of your staff (password protected). • Training Available from Anywhere you have internet access. • Separate Login for Managers to access all your staff’s training results, manage users and assign individual training topics. Works Great with Staff Turnover…just disable the individual user and replace them with your newly hired staff member. • And, all of this for less than $1.50 per clock hour of training. Check out the two videos below to answer some of your questions and show you how to get started. Save Up To 45% Off Our Regular Rate When You Partner with Us Today!